We love collaborating with local businesses and so when we had the opportunity to team up with our good friend and photographer, Lindsey Jane, we were all for it! The Montana Treehouse Retreat was the beautiful setting for these family photos captured by Lindsey Jane. Such a great feature of our property and the happy campers that visit. The laughs are contagious when you are exploring the woods and there is a treehouse on site! Today was pretty exciting at the build site. We hired a crane to come in and help us bring Grandma Mary's big Douglas Fir tree to it's final resting place. This impressive fir will serve as the main center support for our spiral staircase that John Colliander from Treeworks (West Glacier) is custom building for us in conjunction with the Treehouse Guys build team from the DIY Network. 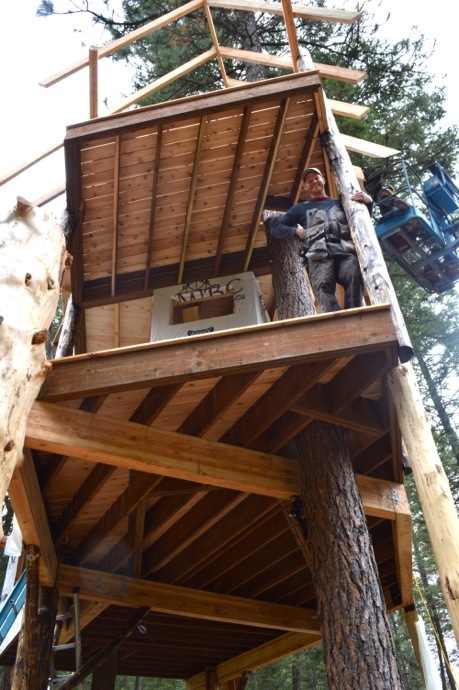 The build was held up until this point as the tree is serving as a centrifugal point to which the builders need to add support beams off of to start the decking and initial subfloor of the treehouse. The amount of work and man hours to even get to this point have been huge but we are reaping the benefits now, as it's SO WORTH IT! How majestic it looks standing up right in the treehouse build site. We only wish Grandma Mary could see it. Can't wait to see how it takes shape and is eventually the main entrance into the treehouse. What a grand site that will be.